In these lessons, we will learn how to obtain the median, quartiles and percentiles from the cumulative frequency graph of the distribution (grouped data). The following cumulative frequency graph shows the distribution of marks scored by a class of 40 students in a test. a) Median corresponds to the 50th percentile i.e. 50% of the total frequency. From the graph, 20 on the vertical axis corresponds to 44 on the horizontal axis. 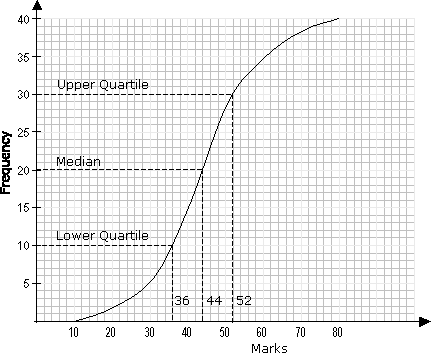 The median mark is 44.
b) The upper quartile corresponds to the 75th percentile i.e. 75% of the total frequency. From the graph, 30 on the vertical axis corresponds to 52 on the horizontal axis. The upper quartile is 52.
c) The lower quartile corresponds to the 25th percentile i.e. 25% of the total frequency. From the graph, 10 on the vertical axis corresponds to 36 on the horizontal axis. The lower quartile is 36. How cumulative frequency diagrams are used to estimate the median and quartiles of a frequency distribution? This video shows you how to interpret cumulative frequency graphs. It shows you how to find the median, lower quartile, upper quartile and interquartile range, IQR. This video helps you to understand how to work out cumulative frequency, draw the cumulative frequency graph and find the median, lower quartile, upper quartile and interquartile range.